The Award for Projects of Social Benefit is presented to a project or team responsible for applying free software, or the ideas of the free software movement, to intentionally and significantly benefit society. This award stresses the use of free software in service to humanity. This year the FSF awarded OpenStreetMap and the award was accepted by Kate Chapman, chairperson of the OpenStreetMap Foundation and co-founder of the Humanitarian OpenStreetMap Team (HOT). Stallman emphasized the importance of OpenStreetMap in a time where geotech and geo-thinking are highly prevalent. "It has been clear for decades that map data are important. Therefore we need a free collection of map data. The name OpenStreetMap doesn't say so explicitly, but its map data is free. It is the free replacement that the Free World needs." Kate thanked the Free Software Foundation and the large community of contributors of OpenStreetMap. "In 2004, much of the geospatial data was either extraordinarily expensive or unavailable. Our strong community of people committed to free and open map information has changed that. Without the leadership before us from groups such as the Free Software Foundation, we would not have been able to grow and develop to the resource we are today." The Award for the Advancement of Free Software goes to an individual who has made a great contribution to the progress and development of free software through activities that accord with the spirit of free software. 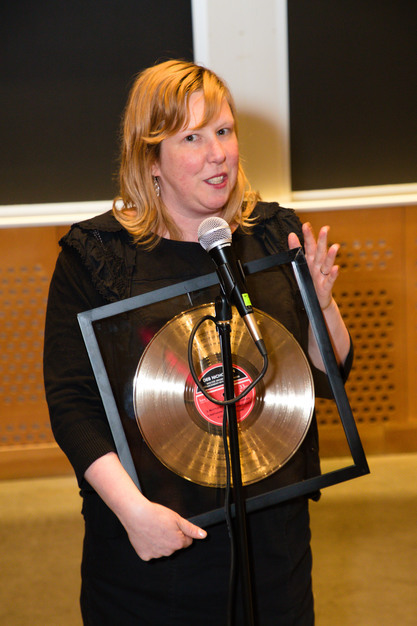 This year it was presented to Deborah Nicholson, who, motivated by the intersection of technology and social justice, advocates access to political information, unfettered freedom of speech and assembly, and civil liberties in our increasingly digital world. She joined the free software movement in 2006 after years of local organizing for free speech, marriage equality, government transparency and access to the political process. The Free Software Foundation recognizes her as an exceptional opinion leader, activist and community advocate. Deborah is the director of community operations at the Software Freedom Conservancy, where she supports the work of its member organizations and facilitates collaboration with the wider free software community. She has served as the membership coordinator for the Free Software Foundation, where she created the Women's Caucus to increase recruitment and retention of women in the free software community. She has been widely recognized for her volunteer work with GNU MediaGoblin, a federated media-publishing platform, and OpenHatch, free software's welcoming committee. She continues her work as a founding organizer of the Seattle GNU/Linux Conference, an annual event dedicated to surfacing new voices and welcoming new people to the free software community. Stallman praised her body of work and her unremitting and widespread contributions to the free software community. "Deborah continuously reaches out to, and engages, new audiences with her message on the need for free software in any version of the future." Deborah continued: "Free software is critically important for autonomy, privacy and a healthy democracy -- but it can't achieve that if it is only accessible for some, or if it is alienating for large swathes of people. That's why it's so important that we continue surfacing new voices, making room for non-coders and welcoming new contributors into the free software community. I also find that in addition to helping us build a better, bigger movement, the work of welcoming is extremely rewarding." Nominations for both awards are submitted by members of the public, then evaluated by an award committee composed of previous winners and FSF founder and president Richard Stallman. More information about both awards, including the full list of previous winners, can be found at https://www.fsf.org/awards. The Free Software Foundation, founded in 1985, is dedicated to promoting computer users' right to use, study, copy, modify, and redistribute computer programs. The FSF promotes the development and use of free (as in freedom) software -- particularly the GNU operating system and its GNU/Linux variants -- and free documentation for free software. The FSF also helps to spread awareness of the ethical and political issues of freedom in the use of software, and its Web sites, located at https://fsf.org and https://gnu.org, are an important source of information about GNU/Linux. Donations to support the FSF's work can be made at https://my.fsf.org/donate. Its headquarters are in Boston, MA, USA. Photo credits: Copyright © 2019 Madi Muhlberg, photos licensed under CC-BY 4.0.